So says the sign that hangs above the prep line at Blues City Cafe on the infamous Beale Street in Memphis, Tennessee. This was our target destination for our third night on the road. Memphis is just a bit over 200 miles from Russellville, Arkansas. We normally stop at Tom Sawyer’s RV Park in West Memphis, Arkansas because our site would be right on the Mississippi River. However, the recent rains have turned the grounds at Tom Sawyer into mud pits and the Mississippi River is swelling due to the spring run off from up north. 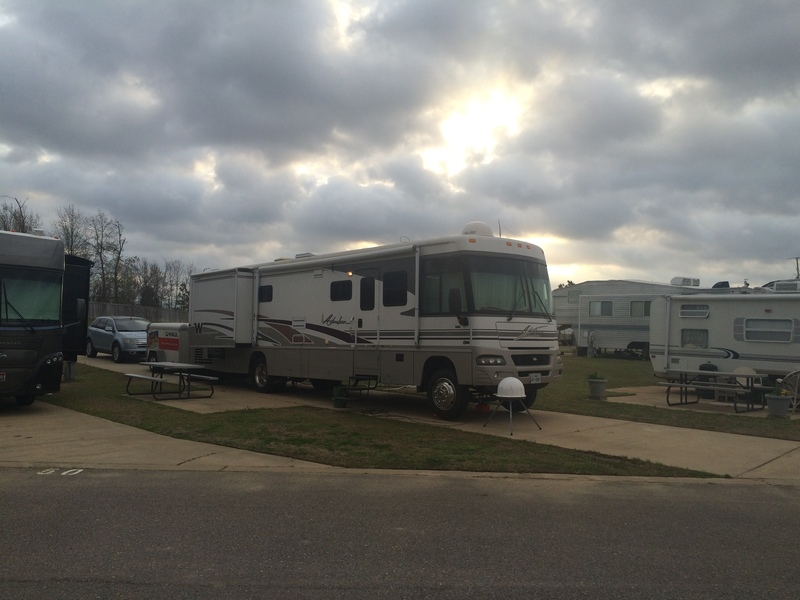 We wanted to stay at Graceland RV Park and Campground but they did not have a site large enough for us, so we moved on down the road to EZ Daze RV Park in Southaven, Mississippi about 18 miles South of Beale Street in Memphis. The weather was cloudy and partly foggy so we could not get a descent photo of the Mississippi River. Trust me when I say it is still muddy. Once we crossed the Mississippi River on I-40, we turned south on I-55 for the short trip to Southaven, Mississippi. Traffic was moderate to light so we were making good time. The large truck in front of me moved over to my left. That is when I saw what looked like a cardboard box on the right side of my lane. The lane to my left was clear so I gentle swerved to my left to avoid the box. That is when I noticed Carol was not moving left with me. I tapped my breaks to get her attention and saw her swerve pretty hard to the left. She just missed the box as she drove past it. Gee, it was only a box. Problem is the box turned out to be a two-wheeled hand dolly that apparently fell out off a trailer from another vehicle. That driver had pulled over on the far left side of the highway and was out of his vehicle trying to figure out how to retrieve his two-wheeled hand dolly from the middle of I-55. This all happened too quickly to get vehicle tags from the driver who lost his load or even think about who to call to report the debris on the road. Fortunately, the traffic was light. I can only imagine a worse case scenario if this had been rush hour traffic. Sheesh people! Secure your load! 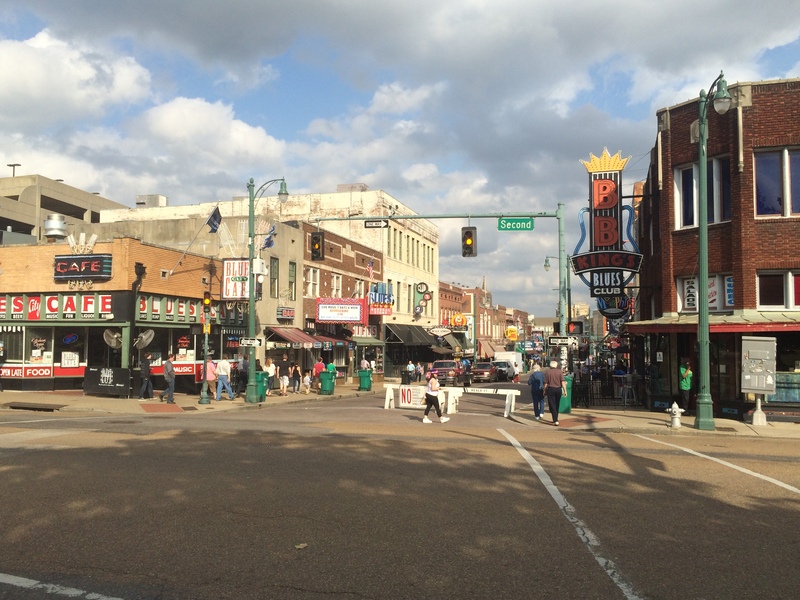 After sharing that wonderful late lunch/early supper, we took a stroll down Beale Street. Even though is was late afternoon, the blues clubs where piping music out onto the street. We stopped by one open air stage to catch the sounds from a local band. This one building caught our eye. The Gallina Exchange Building was built in 1891. 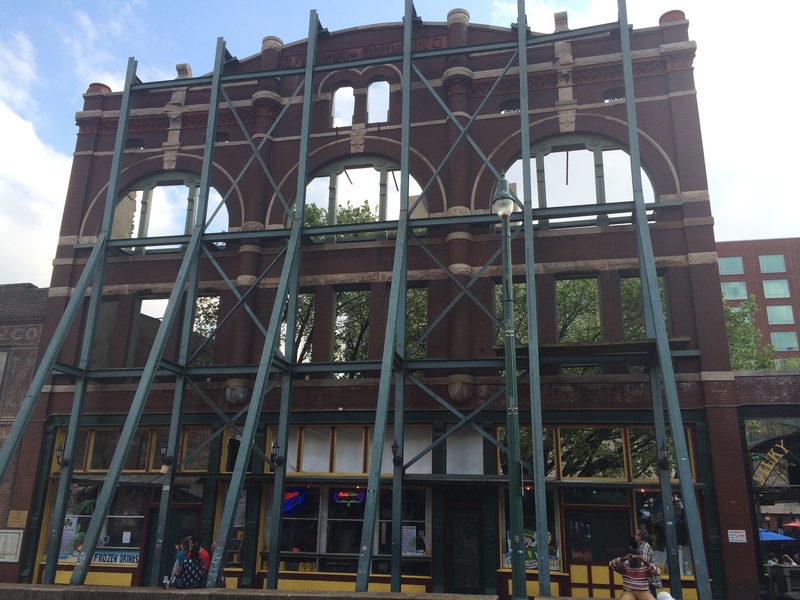 The building had a colorful history until 1980 when it was gutted by fire. The steel girders were put up to hold the front facade of the building in place. A wind storm blew down the sides and rear walls later. This wall is all that remains of the original building. Behind the wall is an open air cafe belonging to Silky O’Sullivan who runs a successful bar and restaurant by the same name. Blues City Cafe is on the left and B.B. Kings Blues Club is on the right. A few years ago, Carol had visited Graceland, home to Elvis Presley, the King of Pop. If you are into overpriced tourist attractions, Graceland is for you. We skipped it. If you travel near the Memphis, you should plan a stop. The largest city in Tennessee is rich in culture and history. You will not be disappointed if you ‘put a little south in your mouth’. This entry was posted in Tennessee, Travel and tagged Blues, Blues City Cafe, EZ Daze RV, Memphis. Bookmark the permalink. Your ribs looked yummy! Looking forward to your/our next stop! They where. 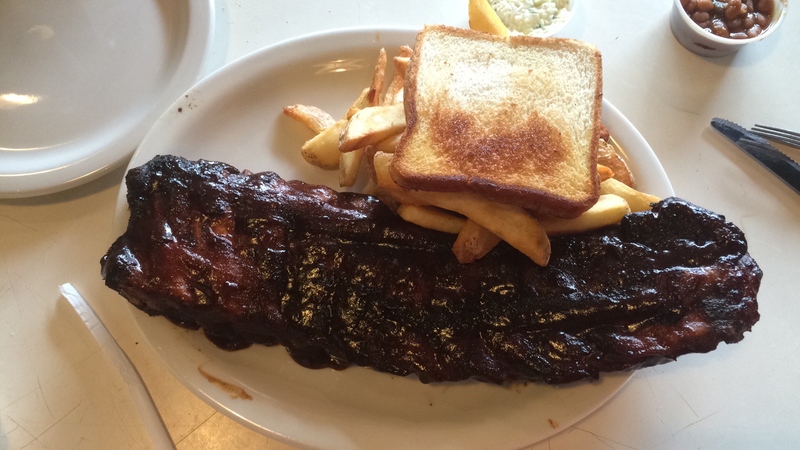 Best ribs ever.